No longer would does the 125mph trains seem the fastest in the world. China reported that it was celebrating the worlds fastest train when it launched a new 260mph train line. China’s new high speed rail will run the CRH380 train which recorded speeds of almost 262 miles per hour, earlier this year. The train called “The Harmony – CRH-380A” reached 258.86 miles per hour during a trial run between Shanghai to Hangzhou. The train registered speeds that were almost 13 miles higher than the earlier record that was broken back in June 2008 by a CRH3 train that ran between Beijing and Tianjin at a top speed of 245 miles per hour.The trains will cover a 126 mile trip in under 45 minutes. 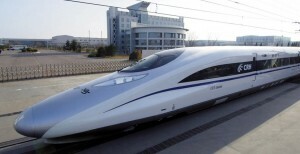 China plans to have about 10,000 miles of ultra high-speed rail by 2012. Chinese officials said that future versions of the trains will be worked on to achieve speeds of about 315 mph. If these trains were introduced in the US, the airline industry would surely go bankrupt. Next Internet Travel Doomed? Google racing to buy ITA!